So happy to be a guest designer for Concord & 9th, one of my favorite companies. 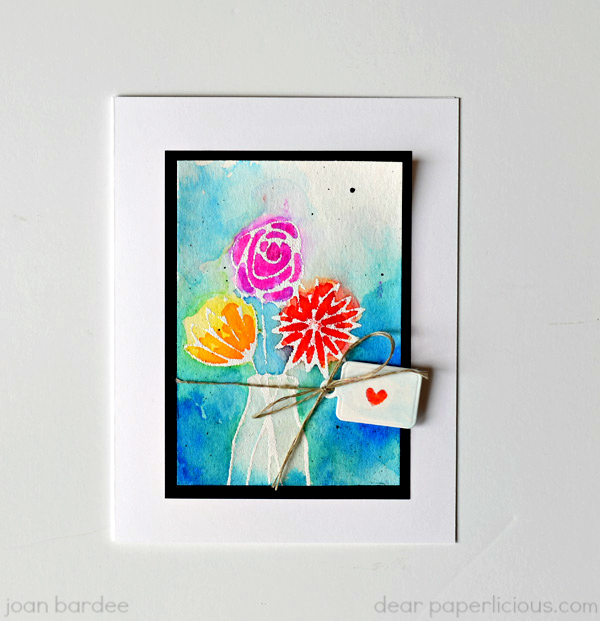 Today I'm sharing 2 cards made with a new, fabulous Bouquet Die. I used two different techniques -- 1. shrink and stamp, and 2. partial die cut. I adhered the fun foam "stamp" to my MISTI with double sided tape and stamped with Versamark onto watercolor paper. After embossing in white, I watercolored, using Tombow markers and Adirondack Dye Reinkers (and Ranger Black Soot Distress Paint for speckling). See that cute tag? It is from Concord & 9th's Bags & Tags Dies, and the little heart is from Concord & 9th's Love You, Mean It. This is my anniversary card for the husband, and I'm happy to report he likes it. For the second card, I die cut just the top of the bouquet and used an Exacto knife to separate the top flower. (Thought I was so clever to do this and then I saw that Concord & 9th posted a gorgeous card with these flowers cut out in white! Ha!) 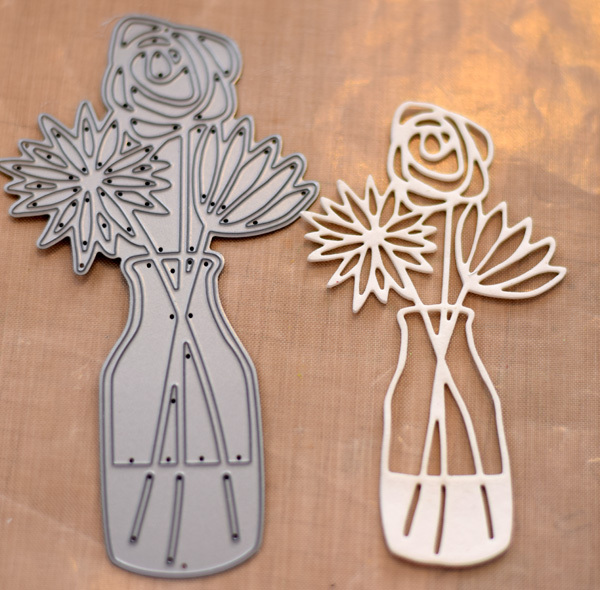 Be sure to check it out - just click on the Bouquet Die in the shop. The orange flowers are double thick and all the flowers are adhered to soft gray cardstock, while the card itself is white linen cardstock. I used a hint from Laura Bassen and sprayed the back of all the flowers with adhesive (I used an Elmer's product). It is so much easier to adhere small pieces this way. 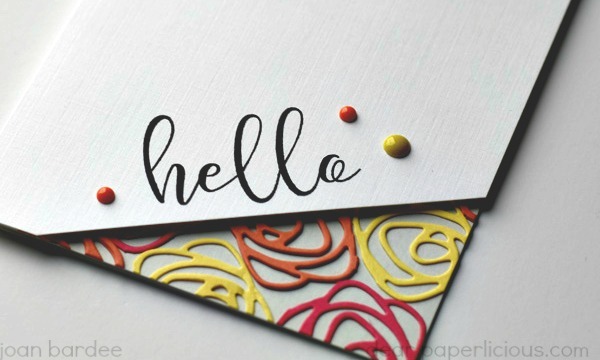 The sentiment is from another fantastic Concord & 9th set, Sophisticated Script. I see that it is sold out again, but it is worth waiting for. Much easier to use than I expected. I'll be back next week to feature more Concord & 9th! LOVE these!!!!!! Congratulations on guesting! You have good reason to be happy Joan, you made 2 beautiful cards! Wonderful job! Love both of them but your watercoloring is fab! incredibly clever and beautiful! Love them both Joan! both cards are great Joan, but really love the design of the second one!! Joan, super congratulations on being Concord and 9th's GD, because WOW...you work magic with their products! Love your cards here! I don't even have words to express how deeply I want to own everything Concord & 9th (need our Canadian dollar to smarten up!). OH so artsy!!! Love the Shrink and Stamp technique... did not know it was an "okay thing to do", YAY!!! if you do it, then it can be done:)) Have a Super weekend! Congratulations on your Guest Design Joan and gorgeous creations! Yeah Joan! Congratulations on guest designing for C9! I've just purchased a few of their stamps and love them! Especially Sophisticated Script. Love your innovative cards! Love both of these cards and you taught me a new trick! Congratulations on being the guest designer. I love seeing your work featured and shared. Congrats, Joan, you did a marvelous job creating with these new products! Hmmm... I didn't know fun foam would shrink. Cool! Two fabulous cards, both very clever. Love all the color on the first and the simplicity on the second. Seems you do an amazing job no matter the style. I really like the die, too! I can't wait to try your fun foam idea - thank you for sharing that! Your cards are just beautiful. YAY you, congrats on guesting!! These are FABulous, love the second one!! Very clever! I love these. Thanks. 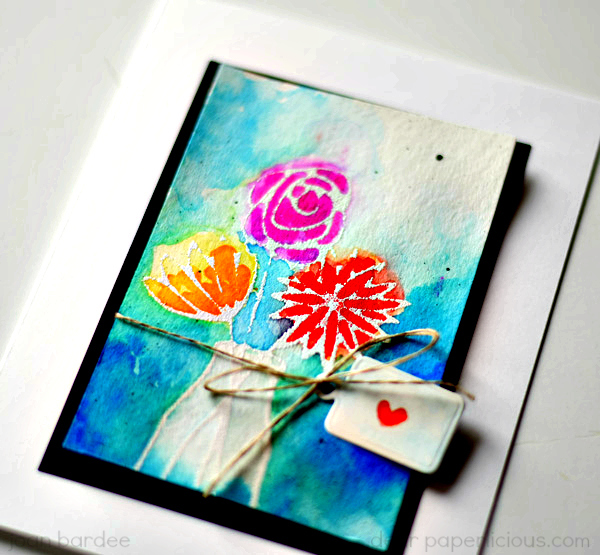 Gorgeous watercolour card! And I've learned something new - I've been cutting foam for stamps for a long time, but I never knew you could heat it too! Thanks, Joan. Hi Joan, Enjoy and am inspired by your commentary and projects. I've noticed that you really like Tombow markers for watercoloring. 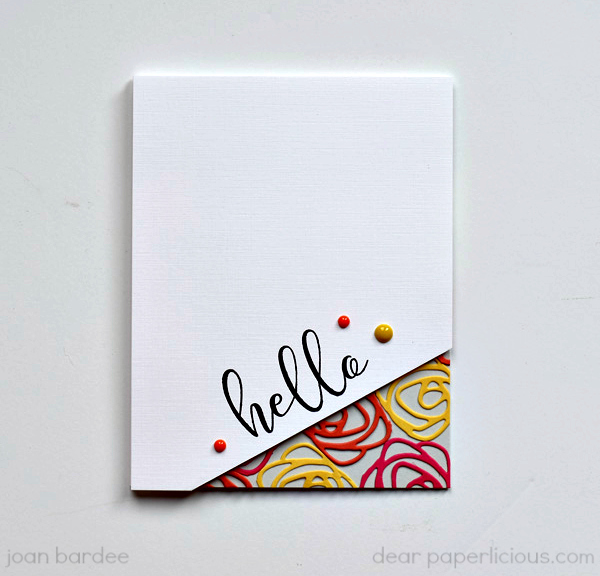 Have you also used Zig markers? If so, what's your opinion? And then, there's Peerless and Kuretake Gansi watercolors--do you enjoy using them? Thanks. Thanks so much. I have not used Zig markers. It's just a money and space issue. I do have Peerless and the Kuretake Gansai. I don't use the peerless too much, I'm not sure why. Most of the time I use the Kuretake and then add some highlights with the Tombow markers. I only have about a dozen Tombow markers and I think that is almost enough (I could use a darker blue). They are terrific simply because I can get more intense color with them and they blend nicely with water on watercolor paper. Hope this helps!